1/21/2009Share this story on Facebook! IC Tap Dance Club members smile for the camera. The theater department’s quadrennial dance concert showcases the inventiveness of the Ithaca College choreography faculty. Learn more in ICView, Ithaca's magazine for alumni, parents of current students, employees, retirees, friends, peers, and neighbors of the College. You can even minor in dance at IC! Now a senior and co-president of IC Tap Dance Club, Fessenden can look back on the memory and laugh. 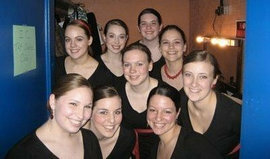 The club, founded in 2002 by Arleigh Rothenberg ’06, welcomes tap dancers of all levels. Almost any club member will tell you the group has a fun and relaxed atmosphere, and this year’s new leaders are staying true to those roots while making significant changes. Co-presidents Fessenden and senior Jenna Valentino are adding more structure to rehearsals. “We’ve normally had open tap,” Fessenden said. Rehearsals now include a warm-up, “across the floor” technique exercises, choreography, and improvisation. Now each dancer gets a chance to lead a rehearsal or teach something new. Fessenden said getting up in front of the group helps you learn, even if it’s scary. The group is also focusing more on improv, in which each dancer spontaneously adds her own rhythm in a circle of tap dancers. Although intimidating to many students, most professional tappers practice improv. Fessenden and Valentino decided to make these changes after active membership declined last year. “In the past, it has always been a challenge to keep everybody committed,” said senior Sarah Hunter, a four-year member of IC Tap Dance Club. Hunter is one of many club members who feel the group has now regained its original energy. “I think it’s sort of like a renewal,” Hunter said. “It was very similar to the experience I had freshman year.” Last year the group didn’t perform as much as it usually does, and leaders didn’t decide on a plan for rehearsal until after dancers arrived. The open atmosphere this year’s dancers are quick to tell you about is obvious to anyone watching a rehearsal. Rock music blasts from an iPod while tap shoes hit the floor, creating their own rhythmic line, but the dancers don’t move the rest of their bodies. Old members help struggling new members, and girls ask questions throughout. Passersby almost always glance in when walking past the open doors of the Hill Center Dance Studio. There is an energy in the group’s sound. The group tries to mix work and fun into rehearsals. Club leaders are flexible with student schedules, encouraging busy students to come just once or twice if they’re at all interested in tapping. IC Tap Dance Club is inviting as one of few dance groups on campus that don’t require auditions. Sophomore Kerryellen Willard, the club’s treasurer, said she was first drawn to the group because she could join without auditioning. Fessenden and Valentino both said they enjoy splitting the presidency of IC Tap Dance Club. They share responsibilities like choreography, e-mail communication, and performance planning. Many club members agree that the co-presidents work well together. “I really couldn’t pick two better people to be co-presidents,” Hunter said. She met Fessenden and Valentino their freshman year at the first rehearsal, when the girls traded phone numbers so they could go to the next rehearsal together and not have to walk in alone. This bond among the dancers still extends to former members. Because of loyalty to the club’s founder, IC Tap Dance Club will not be involved with the Finger Lakes Tap Dance Festival this year. Club founder Rothenberg spent a large amount of time helping to organize the first festival in 2006. “She didn’t even sleep,” Valentino said. “It became her whole life.” Since Rothenberg will no longer be involved with the festival, the group’s leaders felt it wouldn’t be right to participate. They declined to host the festival at the college. Despite this loss, the co-presidents both said the IC Tap Dance Club will continue to perform. Club advisor Michelle Cole thinks the group’s performances expose people to tap dancing and help them to appreciate the art. “It really creates an audience for tap,” Cole said.